A member or associate can update their information at any time using the BHS Member Center. Below is a tutorial on how to update your personal information. Further, specific chapter leaders can now update contact information (see below for details) of members in their respective chapters. 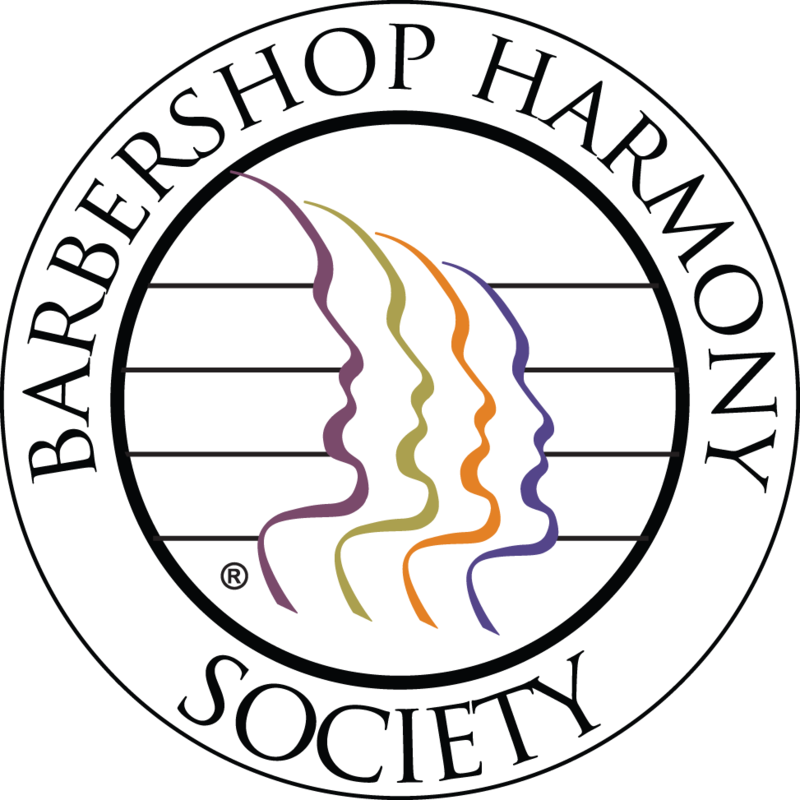 Other members can report incorrect information to the Barbershop Harmony Society Customer Service Team, but the editing of information is reserved for the member/associate or a chapter leader (as listed above) to update. Use your username (email address on file with BHS) and password. 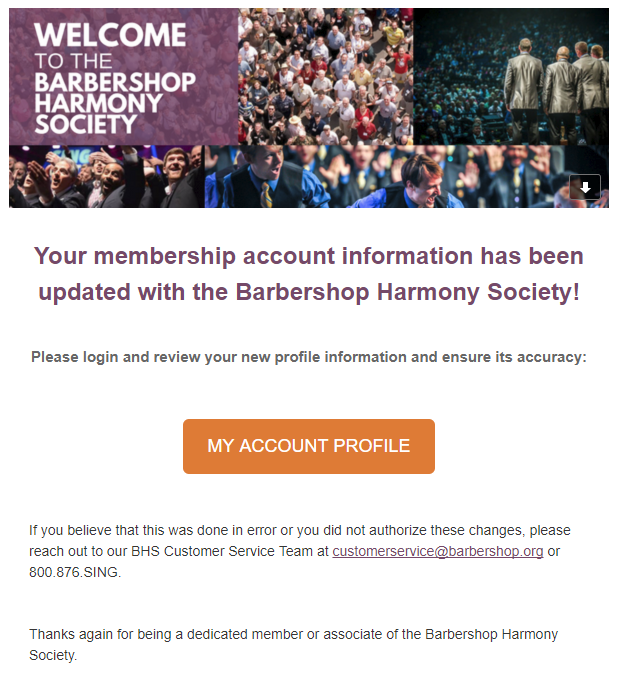 If you forget your password, visit here to be emailed a temporary password: https://members.barbershop.org/members/forgot_password If you have forgotten or you do not know your username, contact the BHS Customer Service Team at customerservice@barbershop.org or 800.876.SING. After logging in, select "My Account" towards the left-hand side then select "Profile". If you would like to view or edit your personal Mailing Address and/or Billing Address, select "Addresses" towards the left-hand side of your personal profile. Here is an example of where to select the option. 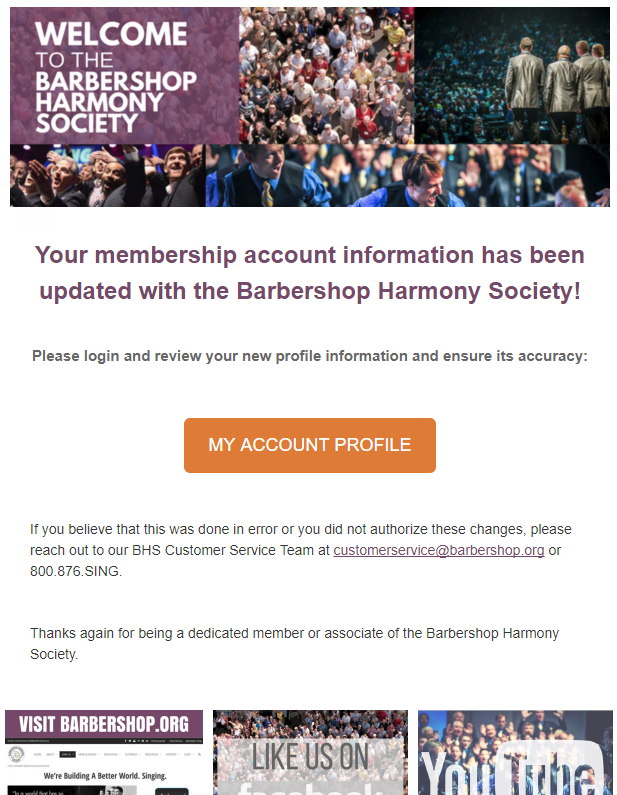 After selecting Addresses you will see your current information hosted by the Barbershop Harmony Society. If you do not have any addresses listed, you can add by selecting from the drop-down menu either a Billing address or a Mailing Address. It is strongly suggested that you list both a mailing address and a billing address even if they are the same. After entering the information and pressing Submit. Your addresses will be saved and displayed on your personal profile. If you are a leader or have served as a leader in the Barbershop Harmony Society, your leadership roles would appear on your profile. Do not worry if this information is not up to date with former leadership roles. If a current leadership role is missing, consider reaching out to us at chapters@barbershop.org or your Chapter Secretary to include. If you scroll to the bottom you will see a list of your current subscriptions with the Barbershop Harmony Society. After submitting any changes to your account information (either by you, a chapter leader, or BHS Customer Service) you will receive an email that looks similar to below letting you know that your information has been updated. Utilizing your Username and Password will activate your permissions as a Chapter leader. If you are not listed in the Member Center as a leader (as annotated above) you will not be able to add a member to your chapter. Then, click My Chapters. Select your chapter. If you are a chapter president, secretary or treasurer you will be able to see the "Chapter Roster" option towards the left-hand side. Click Chapter Roster. Scroll down to where your members are listed. You should notice that their member ID# is underlined and is hyperlinked. 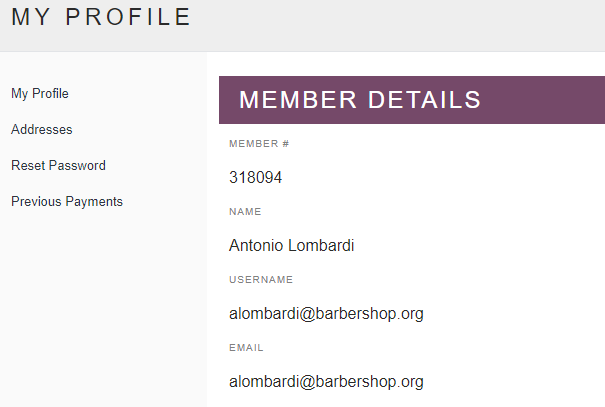 To view or edit the information of a particular member in your chapter, click on their Member ID#. If you would like to view or edit a member of your chapters personal Mailing Address and/or Billing Address, select "Addresses" towards the left-hand side of your personal profile. Here is an example of where to select the option. After selecting Addresses you will see their current information hosted by the Barbershop Harmony Society. If they do not have any addresses listed, you can add by selecting from the drop-down menu either a Billing address or a Mailing Address. It is strongly suggested that a member list both a mailing address and a billing address even if they are the same. After entering the information and pressing Submit, their addresses will be saved and displayed on their personal profile. After submitting any changes to a members account information the member will receive an email that looks similar to below letting them know that their information has been updated by you.